1. Great for hunting, hiking, geology and other outdoor activities. 2. Foldable metal lid sighting window with sighting line. 3. Floating compass dial with 360? scale, luminous magnet arrow adjustable prism lens. 4. This compass is a precision instrument, the deviation of 1 degree or less minimum score value. 5. Fluorescent dribbling fluorescent display. 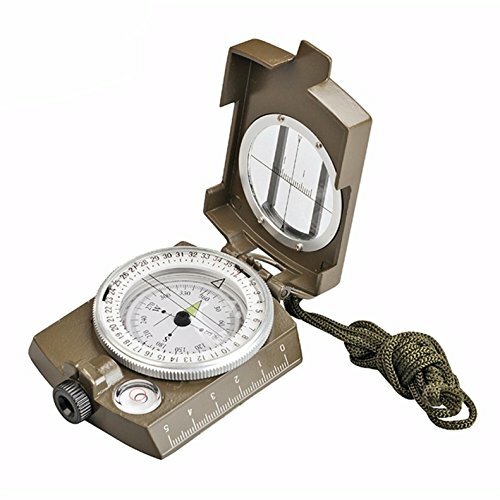 PERFECTLY 3 IN 1 MILITARY COMPASS - This compass is a precision instrument, the deviation of 1 degree or less minimum score value. METAL TOOLS ACCESSARIES - Great for hunting, hiking, geology and other outdoor activities.